Read 2 times. Last read November 24, 2017 to December 24, 2017. 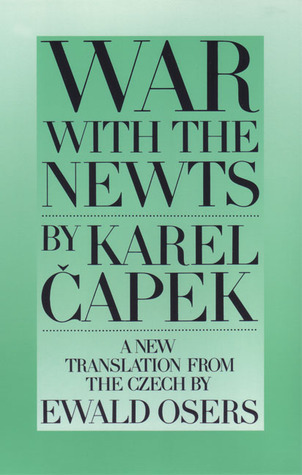 Just so good—the conceit of man-sized intelligent salamanders may sound ridiculous but Capek uses it to great effect in order to satirize just about every aspect of modern western society. It feels like this could have been written yesterday, at more than one point did I think the newts could stand in for automation, climate change, and other manmade cataclysms just over the horizon. The scale at which it tells its story is reminiscent of a KSR novel, but told in a more economical fashion and the device of using news reports, essays and scientific papers as the vessels for exposition somehow reminded me of World War Z. A big rec all around. 69.0% "This could have been written today, it is so searing and fresh."